I’ve discovered a number of surprisingly baby/kid-friendly places in the last few days, so I thought I’d post and share my discoveries. If you’ve seen the outside of a Claim Jumper Restaurant, you might have jumped to the same conclusion that I did. I had heard that they had ridiculously large portions and seeing what obviously looked like mining-for-gold themed restaurant, I totally assumed that it was Red Robin with pick axes. When Mr. Bee suggested we eat there with some acquaintances down in Portland, I figured it’d probably be a nice, loud place where we’d fit in with Baby Bee. Little did I know that I’d be so right and so wrong all at once. When we arrived at the restaurant, the first thing I noticed was that it was not as Red Robin-ey as I thought. (And no, there is nothing wrong with Red Robin.) 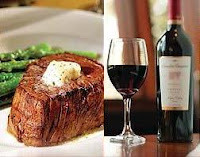 In fact, it was a nice restaurant – somewhere above Black Angus but not as nice as Daniel’s Broiler. Any who, since we had reservations with 2 babies, when we were seated they already had high chairs waiting for us and the table was set with disposable table toppers ( I have these in my diaper bag at all times and looooove them) and oyster crackers to keep the babies busy while we perused the menu! Then, before we even ordered, they brought the babies plates of deli meat, apple sauce, Mandarin oranges and cheese. For FREE. We didn’t even have to buy Baby Bee a meal and she gobbled up the entire plate. For these reasons alone, I have told Mr. Bee that we will now frequent our local Claim Jumper at least once a month! Our food was fantastic and I can’t even believe that there is a nice restaurant that is baby-friendly in existence! Since the grand re-opening of the mall two weeks ago, I have visited it twice to make my obligatory “donations”. During the last visit, I popped in to one of their new “Family Lounges” to change Baby Bee’s diaper. Along one wall, two or three changing stations include sunken tables so your wiggly little monkey doesn’t roll off the counter. There are bottle warmers, wipe warmers, and probably a whole bunch of other things that I didn’t notice because I refused to stand in line to change the baby. Instead, we headed over to the play area that was sprinkled with books and games, along with cushy chairs and a flat screen television playing random kid stuff. This quickly became the secondary changing area on the rug once other moms saw me refusing to wait for a changing station. And, the best thing ever, to the side, two “nursing stations” offer a quiet setting, cushy chairs, a flat screen TV and curtains, for moms. Needless to say, I pretty much had to change my own diaper after stumbling upon such a mom oasis! And this was what I assume is the smaller of the two family lounges at Southcenter. It was crazy busy, but can you blame ‘em? If this house thing doesn’t pull through, I’m thinking about taking Baby Bee and moving in to one of the nursing stations. Okay, so I haven’t actually been to this nail salon yet, but I was thrilled when I read about their Mommy Mondays. Every Monday, from 9am to 3pm, they have an on-site nanny who will entertain your child(ren) so you can enjoy your manicure, pedicure or waxing treatment without distraction. Oh, and they use all organic products and no “fake nails”, so you don’t have to suffer with that icky toxic smell! More reviews to come of this salon soon. SEATTLE — An 86-year-old Seattle woman who refused to sell her little house in the Ballard neighborhood to developers has died. The King County medical examiner’s office says Edith Macefield died Sunday of pancreatic cancer. She died at home. A wind chime hangs in the archway and kitten figurines sit on the windowsill of Macefield’s small home. The two-story, two-bedroom house has stood for more than 100 years and she had lived there since 1966. It was assessed at $8,000 with the lot valued at $120,000. I think it’s just representative of good ol’ Edith,” said Joel Niemeyer, who lives nearby. Everyone knew about “ol’ Edith” who refused to back down even when big business stopped playing nice. The developers built a grocery store, fitness center and parking garage around her home, surrounding it with five story-high cement walls. But in the middle of the battle, Ballard’s soldier in the fight against change died Sunday, leaving many to wonder what will happen to her historic home now. “She was just sort of the epitome of vintage Ballard. That’s what Edith was,” said Niemeyer. Friends and strangers have dropped off flowers, taken pictures of her home and even cried for ol’ Edith, concerned her century-old home won’t be here another 100 years. 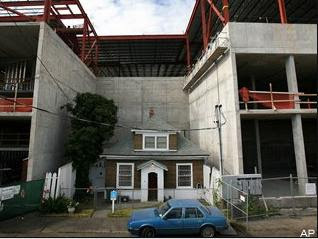 The developers had no comment on the future of the home. Macefield said her only child died when he was 13.